You are here: Home / Tankless Water Heater Reviews / Rheem RTGH 95DVLN Review: Does it worth my money? Rheem RTGH 95DVLN Review: Does it worth my money? 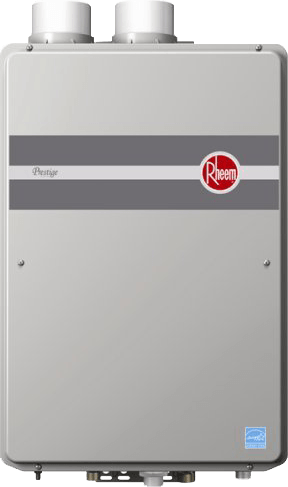 Rheem RTGH 95DVLN is Rheem’s latest tankless water heater. The product provides a rather convenient and economical way of heating water for homeowners. Designed with an energy efficiency of up to 94 percent, Rheem RTGH 95DVLN uses condensing technology (exhaust gasses rtomseheat cold water) to heat water. It thus provides the most efficient water heating solution for a home. Homeowners don’t have to pre-heat 50 or more gallons of water when they don’t need it. Read Rheem RTGH 95DVLN Review below. Rheem RTGH 95DVLN is known for making extremely versatile heating and cooling products that innovatively incorporate new technology and functionality to heat water. From raw material delivery, the manufacturing process, to assembling the final product, Rheem ensures all its products meet strict industry policies and standards. Additionally, the regular tests conducted by government agencies and third-party testing laboratories leave no chance for fault. 1. Efficiency: As earlier highlighted, the tankless heater comes equipped with a stainless steel condensing heat exchanger that provides energy efficiency of 94 percent. Additionally, the intelligent electronic controls fastened on the heater add to the energy efficiency. 2. The rate of flow: Homeowners can now enjoy a flow rate of 9.5 gallons per minute of water; a number that exceeds electric tankless water heaters by far. As such, the tankless heater can conveniently serve three to four bathrooms. Saves on water bills: the tank’s ability to heat water on demand and the reduced flow of water gets homes saving nearly 1100 gallons of water per year. The recirculation kit: the kit pairs with the pump to generate hot water instantly at the tap. Additionally, the tankless water heater has a unique low-NOx system that allows homeowners to install it anywhere (indoors or outdoors) without the need for stainless steel vents. And while it is designed to operate as a whole house, homeowners can mount individual cables in case they want to link different units at once to serve larger spaces. Power consumption: The Rheem RTGH 95DVLN require 199,000 BTUs, but it shouldn’t get you worried. Given that it is 94 percent energy efficient your monthly energy bills should be lower. Heat and output flow: as earlier mentioned the heater has a flow rate of 9.5 GPM. As such, you are assured of constant water flow even when the temperature gets a bit chilly. While there may be minor delays in icy climates, the tankless heater can withstand temperatures as low as -30 degrees Fahrenheit; thus, ideal for locations with elevations as high as 9840 ft above sea level. Comes equipped with a hot-start programming feature that allows it to reduce fluctuation in water temperature during the regular on and off operations. Has a patented safety OFW (Overheat Film Wrap) feature that provides protection in case of breach of the heat exchanger. Rheem manufacturer solely provides such a degree of protection. The EZ-Link cable technology allows owners to connect two tankless heaters in case of high demand operations. It also has various capabilities i.e can hold up to 20 units using a modular controller. A built-in self-diagnostic program that displays maintenance and error codes on the digital controller for easy troubleshooting. Weighing 75 pounds or less, the tankless heater is ideal for both indoor and outdoor use. A digital display indicates the set temperature and maintenance codes. Digital remote controls that have a temperature limit of 140 degrees; note that the remote controls need a thermostat wire (2 conductors), 18 AWG. Some homeowners may purchase additional remote controls that allow them to regulate the temperature of the water heater from different locations. Both PVC and approved Polypropylene vents are ideal for the tankless heater. Note that indoor model comes with a 120-volt power cord. Reduced Emissions: The special low-NOx version helps reduce emissions and fumes. Easy Installation: The self-guided manual provides excellent DIY installation instructions. The model can use both natural and propane gasses. Expensive: The model may be quite pricey compared to other water heaters. One Unit Not Enough For Commercial Use: In the event of business purposes, owners need to install multiple units. Clearly, the Rheem RTGH 95DVLN is designed to improve a homeowner’s lifestyle through the use of advanced technology to save energy and supplying a continuous flow of water at a low cost. Not to mention the digital remote control features that allow you to regulate the water temperature by the touch of a button; a feature that most moms love. Grab one for your home for a more comfortable lifestyle and reduced utility bills. Hope Rheem RTGH 95DVLN Review may clear your views. Take a look at the 5 Best Rheem Tankless Water Heater Reviews. The warranty is actually 12 years on the heat exchanger 5 years parts and 1 year labor.